Grace has big news and she’s veeerrryyyy excited. You see, her best friend, Mimi, is getting a new sister. There’s so much to do before Mimi and her family go off to pick up Mimi’s adopted sister, that Grace is beside herself (as is Mimi) with excitement, anticipation, and a little bit of nervous worry. And oh, yes, there’s also a need to make plans for teaching Mimi’s new sister about the important things in life, like staying away from Crinkles the Cat. As the story opens, Grace is busy putting together a list of facts she knows about little kids. Next, she decides to make Mimi’s sister a book that will tell the new arrival all the things she needs to know. The book is soon finished but what’s next? It’s so hard to plan because Mimi’s parents don’t know exactly when their new daughter will arrive. In the meantime, Grace is soooo busy with other things in her life. There’s school, and Mr. Frank, a teacher who thinks all the kids can make really cool maps; there’s Mom and Dad and all the things that are going on at home; and then there’s the big, big surprise that Dad has for Grace. She thinks it’s a trip to the hardware store, but hold on ‘cause it’s a whole lot more than a new toolbox for Dad. 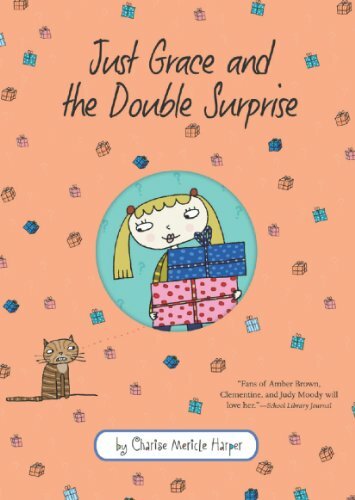 Just Grace and the Double Surprise is an amusing look at the life of a third-grader, fraught with all sorts of turmoil and exploits that face youngsters. Much of the story is written up as advice for readers, such as Grace explaining, “what you can do if you are about to get into trouble” and “what is hard to do,” as well as funny things such as “what makes a third grade class suddenly burst into applause.” All these subjects, and many, many more, are introduced with large font captions to grab attention and make the reading fun and lively. There are also little drawings all over the place to help Grace get her points across. And while the two surprises mentioned in the title don’t come into the story until about halfway through the book, there is plenty of laughter and excitement in the story to hold readers' interest before those surprises are announced. The book is told in the first person by a somewhat hyper, supper-happy Grace who will keep kids giggling at every page. And while this is the seventh book in the “Just Grace” series, readers can easily start with this one and not be lost. Given the “girl talk” throughout, I would suggest this book more for young girls than boys. Quill says: Fans of the “Just Grace” series, and those new to Grace’s third-grade antics, are sure to enjoy this newest book in the series.